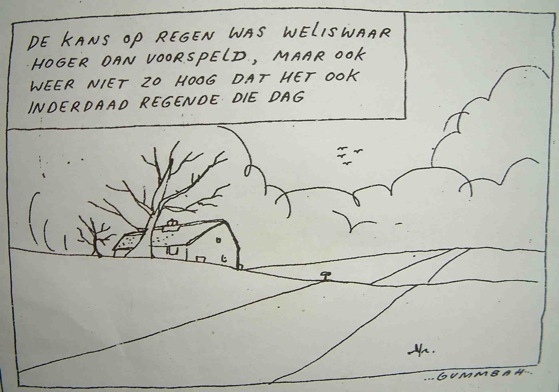 I'm trying to translate this Dutch comic to English. I want to say that the probability of rain turns out to be higher than predicted, but that this probability is not of such magnitude that it actually rained. This is mathematical nonsense ofcourse, but that's the punchline of the joke. My first attempt is: "The probability of rain turned out to be higher than predicted, but not of a magnitude such that it actually rained that day." I can't figure out if this is grammatically correct or not. Does this make sense? Is there an easier, more concise way of explaining the joke in English? "The chances of rain turned out to be higher than predicted, but not so high that it actually rained." Of course, I can't read the original so I'm not sure how close it is. The chance of rain was indeed higher than predicted, but also not so high that it actually rained that day. Is this quote grammatically correct? “None so far” is this grammatically correct? Is this sentence grammatically correct or not?